Rock outcrops – tors – are a feature of the landscape in Cornwall, where I used to live, and also here in the Central Highlands of Victoria. The great lumps of granite echo the shapes of their antipodean counterparts but there the similarity ends. While a tor in Cornwall is often reached by a short muddy stroll through lush and bovine pasture to a view that may or may not be visible through the mizzle, a Victorian tor can be a sweaty, over-heated climb through dusty gum forests and a nervous gaiter-clad wade through knee-deep snaky grass that generally leads to a view across an awful lot of sun-drenched landscape. Don’t forget your hat. 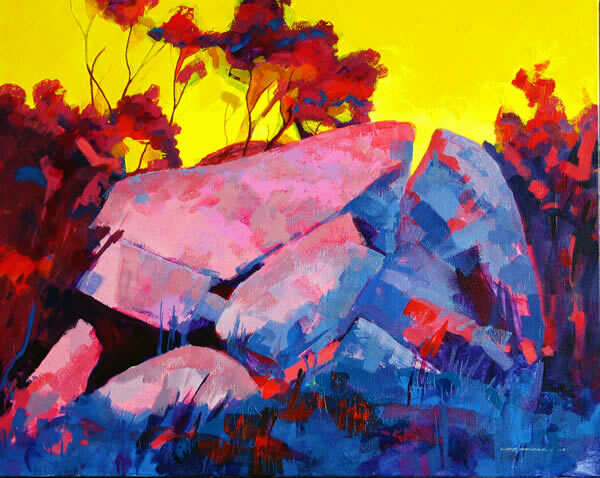 This painting of the Rock of Ages near Maldon was made from quick colour studies and photos taken as the sun was going down. Then it was a torch-lit trek back to the car with wombats and kangaroos for company. Thanks for the feedback Laurel, glad you like it. Thank you for your feedback Mr. Hollywood… or is it Sam? I have visited your blog and I have enjoyed your works which are endowed with a puckish sense of humour.